Why not come in and have a bite to eat or a cup of our fantastic coffee and let the kids tell Santa what they want this year for Christmas! After all, how could Santa possibly know what to put under your tree if you don’t tell him? Santa will be at Centotre on the 6th, 13th and 20th of December between 10am and Noon. At Centotre, our values and beliefs enable us to provide the very best food, using the most excellent ingredients but also look after our community both locally in Edinburgh and Italy where possible. 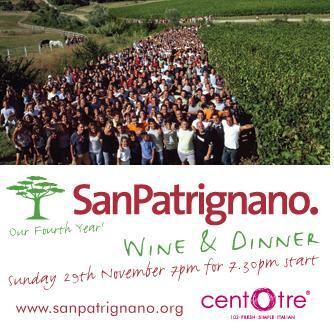 That is why we are hosting our wonderful San Patrignano Wine Tasting event again this yeart. 5 delicious courses perfectly matched with 5 new vintage wines, tickets only £50. Sunday 29th November at 7.30pm. San Patrignano helps young men and woman with serious drug problems regardless of ideology, social background, or religion, and completely free of charge, accepting no payment or funding from their families or the government. Since 1978, San Patrignano has taken in over 18,000 people, offering them a home, healthcare, legal assistance, and the opportunity to study, learn a job, change their lives, and regain their status as full members of society. Whilst we are raising awareness of this amazing project, the real beauty is on the magnificent wines we will be showcasing, along of course with our best cooking, with courses perfectly matched! To accompany this Stefano Bariani, a professional wine connoisseur, from the San Patrignano vineyard will be hosting the night and speaking along with Victor, which is sure to be entertaining. Please RSVP to info@centotre.com or phone us for a chat on 0131 225 1550. Cool tweets from friends over last couple of weeks. Comments like this make it all worthwhile. Victor responds: “We’re both delighted and humbled at such praise, and grateful to customers who take the time to comment on these online guides. It also encourages us to continually keep up and surpass the high standards we hold ourselves to in offering the very best to our customers. Our staff have been instructed to be even more, (if that’s possible), welcoming, professional and attentive in making your festive meal with us truly memorable. Call 0131 225 1550 and book your Christmas table now.